The traditional styling of the Sleigh Storage Bed brings a classic design into the bedroom. The beautifully paneled sleigh headboard is simple with framed detailing. 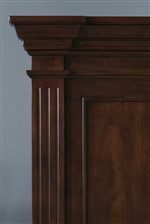 The base of the features carved panels to reflect the headboard and sits on carved bracket feet. There are two large cedar-lined drawers located in the footboard giving you opportunity to store clothing and linens. The bed utilizes wood slat rolls so no need for a boxspring. The bed is rich with a slightly antiqued, knotty solid Appalachian cherry that is hand-rubbed in an antique tobacco finish. The bed is available in Queen, King and California King. The Provence King Storage Sleigh Bed by Cresent Fine Furniture at AHFA in the area. Product availability may vary. Contact us for the most current availability on this product. 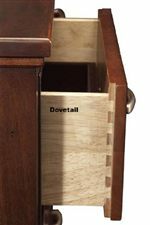 Storage Drawer Size: 25-1/2" x 19-1/2" x 6"
Drawer Suspension Blum Whisper Close Drawer Guides provide an effortless drawer pull, combined with a convenient self-closing feature. The Provence collection is a great option if you are looking for Transitional furniture in the area.